MUFF WIGGLER :: View topic - Small Blacet system around 2x Mini Wave? Small Blacet system around 2x Mini Wave? I really don't want to expand into yet another format, but it is inevitable. I've been wanting some Blacet stuff for years, and always intended it to go into my MU system, but that is reaching capacity - and DIY in that format is sometimes a pain! So now the decision is: do I make a small (6U) Frac system, or do I build these into MOTM format? Do any of these seem like overkill in such a small system, or seem like they wouldn't serve my needs well? Would it be possible or even sensible to use a MicroLFO to feed the MWs, rather than the VCO? Is the Hex Zone easy, moderate, or difficult to program? Is there anything great that is missing? Anyhow... any advice here would be much appreciated!! Thanks! This may be obvious, but one thing to remember is, unless you use the second Miniwave as a quantitizer or otherwise process CV exclusively, you could probably use a second VCO. The Miniwave needs an oscillator to drive it if the task is waveform generation, it's not like Waveform City which had an onboard oscillator. Looking again at the Blacet Micro LFO, looks like it can only get up to 350 Hz, so it really couldn't take the place of a VCO. DAD goes up to 500 Hz. EG1 is apparently ~555 Hz. Any decent single-space VCOs? Not sure how wide the PAiA double VCO is, but it appears to need a +/-18V power supply. Knob spacing and whether panels are cramped or spacious are choices entirely up to the module designer/manufacturer. Consider the multiple module. In Euro, this module could be a single row of 3.5" jacks in a very skinny module barely wider than the jacks themselves. But it doesn't have to be. It could be in a wider module, but whether that would be wasted rack space or good ergonomics is your judgement call. Frac modules are spaced in 1.5" increments (1.5", 3", 4.5", etc) so a Frac multiple panel with just one row of 3.5" jacks would certainly be spacious. There is nothing preventing a Frac manufacturer from releasing a .75" panel. I haven't seen any. More likely, the Frac module designer would keep the panel width at 1.5" and add a second row of jacks. Euro modules have mounting holes closer to the edge of the module as compared to Frac modules. This perhaps could allow an extra knob or jack as opposed to Frac. Cramming a lot of stuff into a panel can happen in Frac or Euro. PAIA's 9700S original series are Frac and have a lot of functionality in one panel. Their 9710K VCA puts the functionality of 3 VCAs, a white noise source and ADSR/LFO Envelope Generator in a 3-inch panel with thirteen 3.5" jacks, one toggle switch, an LED, and five pots. Yeah, I realize that ergonomics are specific to individual manufacturers and modules. Blacet seems pretty consistent, spacing wise, so I was curious how it compares to an "average" Euro module. 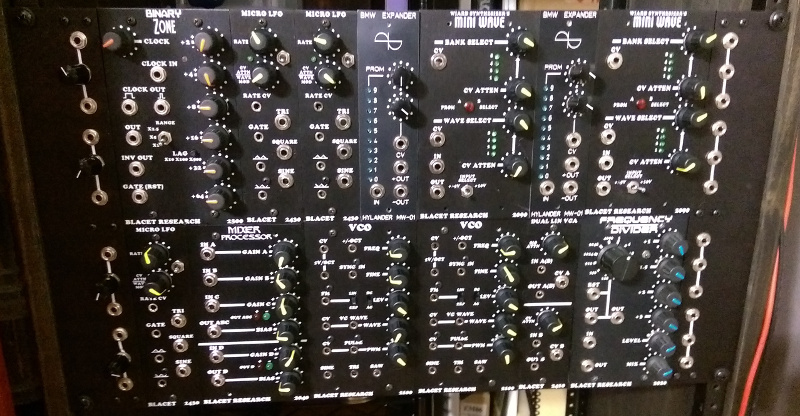 The spacing on the SynthTech Euro modules is generally OK, but I wouldn't want to go much tighter for a full system. Re: mults and spacing, I seem to recall Metalbox offering mults (and other utility stuff like switches for remote access of certain module parameters) built into custom rack ears. This frees up a lot of space that usually goes to waste in Frac. If I didn't have custom Wiard logo rack ears that look too nice to drill holes in them, I'd definitely have gone that route. Another space saving solution is to use Blacet's passive Mult/ Att module without rack mounting them. They don't need power and they're relatively light weight, so you can just plug them between patch cords dangling in the air, or if you want to be on the safe side regarding your patch cords and jacks (recommended), lay them on the table in front of the system. Blacet's typical way of laying out his modules, with a row of pots down the right side and a row of sockets down the left works pretty well I find. I've owned a little bit of euro (ditched it for various reasons) the only euro gear I had that was as good as Blacet for spacing/ergonomics was Verbos. Others may think differently ofc. The only other readybuilt frac stuff I have is a set of Wiard 1200 modules, these for me work at least as well as Blacet's, for all the post/socket standard spacing is different. All of the other Frac stuff I have I built from CGS, MOTM, JH etc gear, I copied the spacing mainly from Wiard 1200 but also a bit from Blacet. I would also ditch the scanner, which is the one and only Blacet module I own that I'm not very taken with. I would replace these with a second VCO (so you can do MiniWave waveshaoping on 2 different sources, also audio rate FM between 2 of the Blacet VCOs sounds nice I think) and also either an LFO or a second D/A/D. I notice you don't have a filter, and will point out that if you can snag an example of the old, discontinued "Final Filtre", it has a built in AD envelope that can cycle and the eg also has it's own output so it can work independently of the filter itself. The Final filtre also has a really unusual timbre, which I like but which you may not. Or may. Worth looking out for one nevertheless. The full Blacet envelope, the "EG1" is fantastic, I think the best EG available in any format. The miniwave will work with a low frequency input, transforming the shape of an LFO wave as it does an audio signal. The only 2 things I don't like about the hex zone are that it has way too few memories, and that the way of chaining patterns together is a bit fiddly. That apart it's a piece of piss to use, really good UI. Fantastic module. The PAiA 9720 VCO is a triple wide panel. You can easily change the power requirements to +/-15V by removing R1 & R2 and jumpering it with bare wire. It works great. I *think* MW can act as window comparator too, off the top of my hat, tho like all MW emulations of continuously variable functions the VC aspect (in this case window width, position, polarity) will be quantized (e.g. to 16 steps if you fill one Bank with it). MW/ WFC is so versatile & so limited at the same time, I feel it takes years to master. Replace the Window Comparator with a Binary Zone. Trust me. I know things. Consider replacing the Dual Freq Divider with a Metalbox Gated Comparator. Blacet pot and jack spacing is plenty roomy, and the Panasonic pots he ships with the kits are stiffer than a lot of other varieties so you are unlikely to knock one out of kilter with a sideswipe. There is a panel schematic somewhere on the Blacet site if you want to cut your own panels or order from FPE; I've made literally dozens. Yes, the MW can act as a window comparator; it's on the Socket Rocket chip, you'll get one with your kit, check the manual for the bank and wave info. 3rd party ROMs: I was never able to really engage with Vector1, but literally every other ROM out there is money. I put the Morphine chip into one of my WFCs, I liked it so much. Don't skip on the Scale Quantizer. One additional thought. If you are just stepping into 1/8" with this, consider building in banana frac. Thanks for all the solid advice! I think I am pretty sure I will be going Frac, rather than MOTM, for these builds. Well, seems like I'll be ditching the Window Comparator for a 2nd VCO! Sounds good. I talked to a friend yesterday who had a Blacet system back in 2004/2005 also tell me that the 2nd VCO was a must, and that the Binary Zone is a must. So I will be on the lookout for that. Re: mults and spacing, I seem to recall Metalbox offering mults (and other utility stuff like switches for remote access of certain module parameters) built into custom rack ears. This frees up a lot of space that usually goes to waste in Frac. Hmm, didn't realize they had a 2-unit width one, though I am seeing it now on Modulargrid. Is their website not really up-to-date, I guess? First modular in 1/8" (I have a TTSH, 1601, and SEM), so yes, I'm considering bananas here. (Besides Serge, I also have bananas on my Steiner-Parker Synthasystem.) Just unsure of the extra time involved (Blacet looks appealing because all the parts are there and it should be pretty quick assembly), and I don't really know if this is a viable option on something like a Noisering (and seems possibly sacrilegious, haha!). If you have second thoughts about the cost and space requirements of a drill press (they are REALLY HEAVY for what it's worth), may I humbly suggest a Roper-Whitney hand punch with a 1/4" bit? I have two of them, they will punch through Blacet panels like butter and if I throw my weight on them, I can cut clean through a 3mm panel from FPE. Hmmmm, He might not be listing it, but I bet if you drop him a line he can still build the 2U version. Perfect! No second thoughts about a drill press, but now is the worst time to pick one up (doing a lot of rearranging/cleanup/renovation/etc. in the garage... slowly). Thanks! A step bit is a great way to make concentric accurate holes in thin panels. No drill press or punch needed! So I took a closer look at this, an I think that I originally thought it was something that it isn't... I originally thought it would do cross-fading, like the Modcan one apparently does. But, looking at things again, that doesn't appear to be the case with the Blacet. Is it purely a voltage-controlled mapping of inputs to output, i.e. CV-IN < 1.5V: Out = In1; CV-IN > 1.5V && CV-IN < 3V: Out = In2; CV-IN > 3V: Out = In3? (The voltages in my example are purely arbitrary.) I know there's a trimpot for overlap, but does it just mix the full signals, rather than cross-fade, where, for instance, in the above example, between 1.5 and 1.75V Out = In1 + In2? Sorry for the crappy cell-phone picture (plus the MWs aren't screwed in since I'm awaiting the rest of the ROMs for the expanders), But, if you couldn't guess based on the module selection, I have more goodies on the way (and a Bananalogue 3P sitting on my desk) and will be ordering another RAK-2, etc. soon. These Blacet kits are seriously addictive. And the LFO switch mod is a total must-have. It is also providing a new palette of sounds which will nicely complement (and contrast with) my other modular gear. So far I find the workflow to be different compared to my other gear, which is a good thing. The knob spacing is a tad tight in places, but the fact that they are only clustered vertically (and not horizontally) makes it work out fine. Glad I added some Blacet to my studio! I didnt realize there were 3rd party ROMs still being sold anywhere. Any links? What are you doing for a VCF? Thanks! Even though they didn't turn out aesthetically perfect, I'm so glad that I did the rack ears. No VCF yet - it looks like I'll be getting some nice discontinued stuff from a fellow wiggler soon that'll help fill that void, but I don't wanna jinx it! Filthy Filtre looks nice, but I have so many SVFs in other formats - the VC Mode and All-Pass are the most interesting parts to me. Final Filtre is relatively easy to find used, and a 5-pole filter + AD seems pretty nifty.